Police drew their guns after a pursuit ended in a crash in Glendale on Tuesday. Multiple Valley law enforcement agencies were involved in a pursuit that went from central Phoenix to Glendale and ended in a deadly shooting. Glendale police say the suspect was shot and killed after the pursuit ended in a crash involving officers in an apartment complex near 63rd Avenue and Maryland in Glendale. Police believe the suspect was involved in an armed robbery near 32nd Street and Thomas earlier Tuesday. The suspect is also believed to be involved in several other robberies and at least one carjacking in the last few weeks. 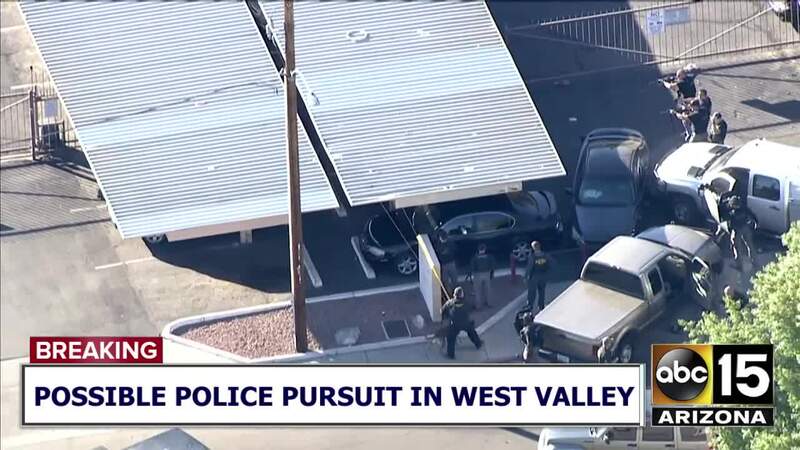 Phoenix police began the pursuit, and the vehicle was eventually stopped in Glendale by what appeared to be unmarked police vehicles. The suspect was seen getting out of the vehicle before police eventually used deadly force. No officers were injured in the shooting. It's unclear if the suspect fired at officers. Media staging location for @phoenixpolice 998 will be at 65th Ave and Maryland north side. Thank you for your patience no reports of any officers injured. No info yet on suspect.